In an effort to start making parts of one’s blog more useful one has updated the Doctor’s Top London restaurants listing. One is pondering whether Wild Honey should join the list having visited last week but a return visit is required in order to assess its true merit. Now, it must be said that Sir Cosmo levelled a very real criticism of one’s London list which is valid. He proposed that there should be more ethnic/asian restaurants in one’s list. This is true! However, given that one often has to cater for the tastes of one’s usual companion, Fortescue, such culinary experiences are rare. In order to update one’s prior omission there are now two “Asian” restaurants in the list, namely Amaya and Shikumen. The latter is a superb Chinese in West London serving superlative dim sum. One has Sir Cosmo to thank for the introduction. The former, Amaya is a very classy Indian which comes highly recommended. Below is the link to list.. As ever, if one has any feedback then please feel free to bombard me with your emails! Mange bien mes amis! 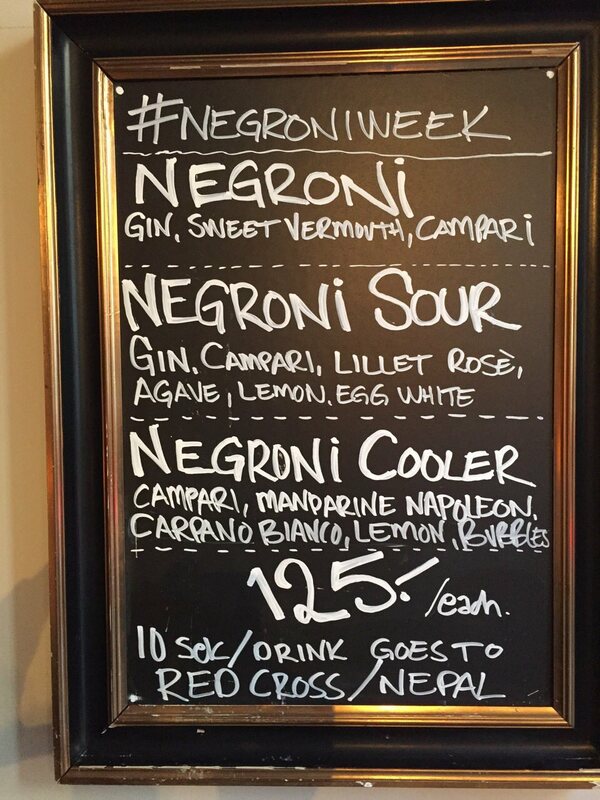 and please forgive the gratuitous photograph of a board advertising Negroni’s which is your Doctor’s favourite cocktail. One hope’s it got your attention. Tomasino here… I also enjoy negronis and, in fact, am enjoying one as I type this reply! Tomasino, you are a man of great discernment in your choice! I look forward to drinking one with you before long!